If you yearn to do more on your vacation than relax in the sun or go sightseeing, consider joining the growing number of travelers ages 50 and over opting for volunteer service vacations. Nowadays, you don’t need to join the Peace Corps to travel to exotic destinations and serve others. Numerous organizations now offer short-term volunteer projects in the U.S. and around the world, lasting anywhere from a few days to a few months. Common program themes include teaching English, working with at-risk children, and assisting scientists with environmental research. What do you pay and what do you receive? Unless a volunteer organization is fully funded by the government or some other source, you’ll have to pay a fee of a few hundred to a few thousand dollars to participate. This fee usually covers pre-trip orientation information, ground transportation, room and board, on-site training, the services of a project leader, and a contribution to the local community that covers material and services related to the project. Airfare and insurance are usually extra. It is highly recommended that you purchase comprehensive travel insurance that includes emergency evacuation coverage, especially for trips outside the U.S. Overall, the per-day cost of a volunteer vacation is often lower than that of a traditional vacation. And, if the organization running your trip is a nonprofit, the costs of your trip, including airfare, are tax deductible. According to Philbrook, you can recover up to a third of the total cost of a Global Volunteers program with tax deductions. 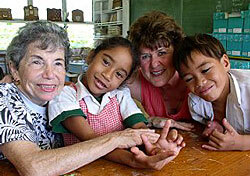 What organizations offer volunteer vacations for seniors? Global Volunteers offers two- to three-week service programs in 19 countries including the U.S., Ireland, China, Ghana, and the Cook Islands. All programs are community-based (meaning that volunteers work at the invitation and under the direction of locals) and may involve caring for disabled children, working with indigenous people, or assisting in a variety of other local projects. Rates range from $650 to $2,595, excluding airfare and insurance costs. All program costs and airfare are tax deductible. While Global Volunteers is open to people of all ages (including minors traveling with a parent or grandparent), more than 60 percent of its volunteers are ages 50 or older. (The oldest volunteer to date was 92 at the time of serving.) To learn more, visit the Global Volunteers website. This highly regarded senior tour operator leads volunteer service programs for travelers ages 50 and up in addition to its more traditional learning vacations. Currently, Elderhostel lists about 50 service programs in its tour database. Service tours vary in length from four to 15 nights, and prices range from about $500 to $3,000, not including airfare. Only a portion of the program fee is tax deductible because the tours include educational field trips and lectures in addition to volunteer service. More than half the service programs are based in the U.S., but there are also projects in more exotic destinations like Peru and China. Sample projects include preserving dinosaur tracks in Zion National Park and teaching English in Xi’an, China. Go to the Elderhostel website to find out more. This international volunteer organization has a diverse selection of programs, with about 300 different projects in 24 countries ranging in length from one to 24 weeks. Travelers can choose to participate in standard volunteer projects like teaching English, or opt for more unique pursuits such as tsunami-relief projects in Sri Lanka or wild animal rehabilitation in South Africa. One-week programs start at $995, excluding airfare. Additional weeks cost $200 to $300 each. Because i-to-i is a for-profit company, trips are not tax deductible. Most i-to-i volunteers are in their 20s and 30s, but the number of participants ages 50 and over is growing. Currently, about 25 percent of its volunteers are 50 and up. Visit the i-to-i website for more information. How do I know if volunteering is right for me? Am I healthy enough and physically fit for the tasks required? Am I willing to learn about an unfamiliar culture, language, and environment? Can I work as a member of a team under the direction of local people? Can I retain flexibility and a sense of humor, even in challenging situations? For more information about service work and volunteer opportunities for older travelers, check out TransitionsAbroad.com, VolunteerOverseas.org, and VolunteerInternational.org.